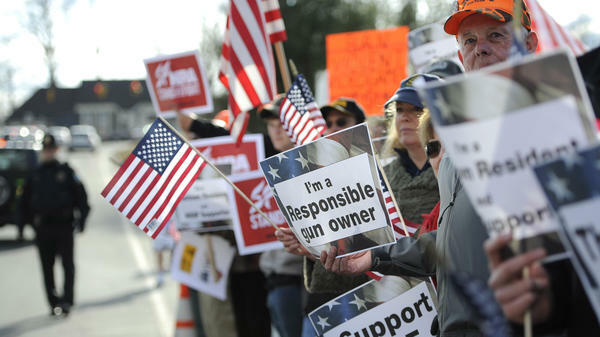 Supporters for gun rights gather outside the National Shooting Sports Foundation headquarters in Newtown, Conn., on March 28. 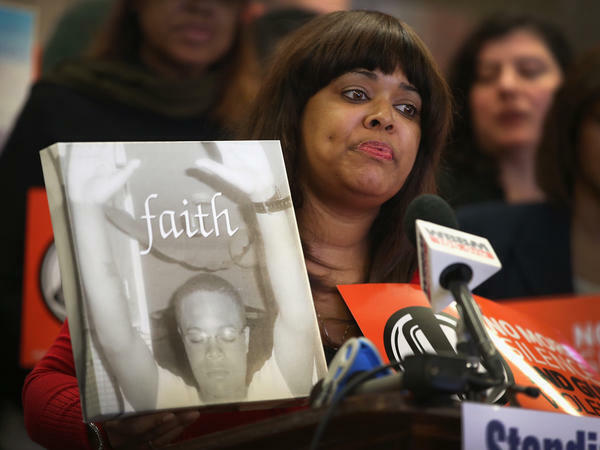 Shundra Robinson holds a picture of her son, a victim of gun violence, at a gathering in Chicago on the anniversary of the shootings at Sandy Hook Elementary in Connecticut. For gun control advocates hoping to see federal gun laws tighten after the shootings in Newtown, Conn., 2013 was a disheartening year. A narrow provision to expand background checks failed in the Senate. For gun rights activists, the death of that legislation proved once more their single-issue intensity and decades-long grass-roots organizing were enough to prevail. Those are also valuable lessons for their opponents. It may have been the year gun control legislation collapsed in the Senate, but Shundra Robinson is grateful for 2013. It's the year she decided to jump into gun control advocacy, which became a way to speak for the son she lost three years ago. "I feel like he still has a voice," says Robinson. "Even though he's no longer here in the physical, he's still speaking." Her son, Deno Wooldridge, was gunned down on his grandmother's porch in Chicago by a group of unidentified men when he was 18. Robinson says it took the massacre of 20 schoolchildren more than 800 miles away for people to absorb what happened to her son, and to see gun-ravaged Chicago with fresh eyes. At first, Robinson wished the world had reacted with the same outrage when Deno was killed. "But guess what: Another part of me was like, 'Well, thank God that finally they're seeing that it's a problem,' " she says, "and so I consider my son being connected. So the Newtown babies are all of our babies. To me, every child that's murdered I consider mine." And many residents in Newtown felt the same. Newtown Action Alliance reached out to Robinson and other Chicago parents touched by tragedy, asking them to join its fight for stricter gun control laws. These small bonds among strangers multiplied across cities all over the country. They helped 2013 see a record surge in grass-roots organizing among gun control advocates, and more political money than ever to tighten gun laws. But they met defeat on Capitol Hill in April, when a provision to extend background checks to gun shows and online sales died in the Senate — even as polls showed 90 percent of Americans favored expanding background checks. President Obama blamed the other side's tactics. "The gun lobby and its allies willfully lied about the bill," President Obama said in a speech the day the legislation failed. "They claimed that it would create some sort of Big Brother gun registry, even though the bill did the opposite. This legislation in fact outlawed any registry." As angry as gun control advocates were, they learned a few lessons from the gun rights organizers. One of them was about money. The Sunlight Foundation, a government watchdog group, reported that the gun lobby outspent the gun control lobby this year by a factor of seven. That's a regret for Mark Glaze, executive director of Mayors Against Illegal Guns. "We now know the NRA poured millions of dollars into persuading people to call their senators and tell them to stop any kind of progress. And the truth is, that was effective," says Glaze. "You know, there were more phone calls in some offices on their side than on ours, and that makes a difference — as it should. We would do that differently." Mayors Against Illegal Guns theoretically has the resources to spend. Its founder is billionaire and outgoing New York City Mayor Michael Bloomberg. And in Bloomberg, the National Rifle Association has for the first time a counterweight with vast resources. But 2013 also reminded everyone that sometimes money can't substitute for good old-fashioned grass-roots organizing. The NRA coordinated its base well in 2013, Glaze points out. "NRA has owned this issue for a generation. They've had the only political operation," he says. "They have the grass-roots strength, and we simply weren't there yet. But we're getting there." Gun Owners of America, another gun rights organization, also showed the power of mobilization. The group doesn't have the cash or the membership the NRA does, but its no-compromise stance keeps pressure on the NRA. Back in April, Gun Owners of America showed with one email alert that it could help flood the phone lines on Capitol Hill days before the Senate vote. "We thank God and we thank our wonderful members, and between the two of those, we have no power that doesn't come from them," says Michael Hammond, the group's legislative counsel. He adds, "I think most of our people understood that [the bill] was exploiting a tragedy for a solution which didn't address the tragedy in any way, and that it was intended to be nothing but a stair step to the next, even more onerous demand for gun control." Senate leaders are promising to bring up background-checks legislation again. But one of the bill's authors — Democrat Joe Manchin of West Virginia — says that vote isn't happening anytime soon. "You know, there's no use to just push. I mean, I'm not pushing a vote for the sake of just taking a political vote. If we're going to take a vote, I want to make sure we have the numbers to pass it," he says. And right now, Manchin says, he just doesn't have them. This has been a disheartening year for gun control advocates. They hoped to see federal gun laws tighten after the massacre at an elementary school in Newtown, Connecticut. But even a narrow provision to expand background checks failed in the U.S. Senate. For gun rights activists, blocking that legislation proved the effectiveness of their grassroots organizing once again. NPR's Ailsa Chang looks back on the battle over gun control this year and lessons learned on both sides. AILSA CHANG, BYLINE: It may have been the year gun control legislation collapsed in the Senate, but Shundra Robinson is grateful for 2013. It was the year she found her way from evangelism to gun control advocacy. And that became a way to speak for the son she lost three years ago. SHUNDRA ROBINSON: I feel like he still has a voice. Even though he's no longer here in the physical, he's still speaking. CHANG: Her son, Deno Wooldrige, was gunned down on his grandmother's porch in Chicago by a group of unidentified men when he was 18. Robinson says it took the massacre of 20 school children more than 800 miles away for people to absorb what happened to her son, and to see gun-ravaged Chicago with fresh eyes. At first, Robinson wished the world had reacted with the same outrage when Deno was killed. ROBINSON: But guess what? Another part of me was like, well, thank God, that finally they're seeing that it's a problem. And so I consider my son being connected. So the Newtown babies are all of our babies. All of our babies. To me, every child that's murdered I consider mine. CHANG: And many residents in Newtown felt the same. Newtown Action Alliance reached out to Robinson and other Chicago parents touched by tragedy, asking them to join its fight for stricter gun control laws. These small bonds among strangers multiplied across cities all over the country. They helped 2013 see a record surge in grassroots organizing among gun control advocates, and more political money than ever to tighten gun laws. But they met defeat on Capitol Hill in April, when a provision to extend background checks to gun shows and online sales died in the Senate. Even as polls showed 90 percent of Americans favored expanding background checks. President Obama blamed the other side's tactics. PRESIDENT BARACK OBAMA: The gun lobby and its allies willfully lied about the bill. They claimed that it would create some sort of Big Brother gun registry even though the bill did the opposite. This legislation, in fact, outlawed any registry. CHANG: As angry as gun control advocates were, they say the other side taught them a useful lesson. You need to go hard and never let up, even when the public doesn't want to hear it. Take, for example, when the Second Amendment Foundation chose the December anniversary of the Newtown shootings to air ads like this. CHANG: In 2013, gun rights groups also taught the other side a lesson about money. The Sunlight Foundation reported that the gun lobby outspent the gun control lobby this year by a factor of seven. That was a regret for Mark Glaze, executive director of Mayors Against Illegal Guns. MARK GLAZE: We now know the NRA poured millions of dollars into persuading people to call their senators and tell them to stop any kind of progress. And the truth is, that was effective. You know, there were more phone calls in some offices on their side than on ours, and that makes a difference, as it should. We would do that differently. CHANG: It's not as if Mayors Against Illegal Guns didn't have the resources to spend. Its founder is a billionaire - outgoing New York City Mayor Michael Bloomberg. And in him the NRA has for the first time a counterweight with vast resources. But 2013 also taught both sides that sometimes money can't substitute for good old-fashioned grassroots organizing. MICHAEL HAMMOND: We thank God and we thank our wonderful members. And between the two of those we have no power that doesn't come from them. CHANG: Michael Hammond is legislative counsel for Gun Owners of America. The group doesn't have the cash nor the membership the NRA does. But its no-compromise stance keeps pressure on the NRA. And back in April, it showed with one email alert it could help flood the phone lines on Capitol Hill days before the Senate vote. Senate leaders are promising to bring up background checks legislation again. But the bill's author, Democrat Joe Manchin of West Virginia, says that vote isn't happening any time soon. SENATOR JOE MANCHIN: You know, there's no use to just push - I mean I'm not pushing a vote for the sake of just taking a political vote. If we're going to take a vote, I want to make sure we have the numbers to pass it. CHANG: And right now, he says, he just doesn't have them. Ailsa Chang, NPR News, the Capitol. Transcript provided by NPR, Copyright NPR.